Five IRC supermaxis (measuring 100ft, or 30.48m, in length), out a decade-record of 118 sailing yachts, have signed up to enter the seventieth Sydney to Hobart race in Australia on Boxing Day. 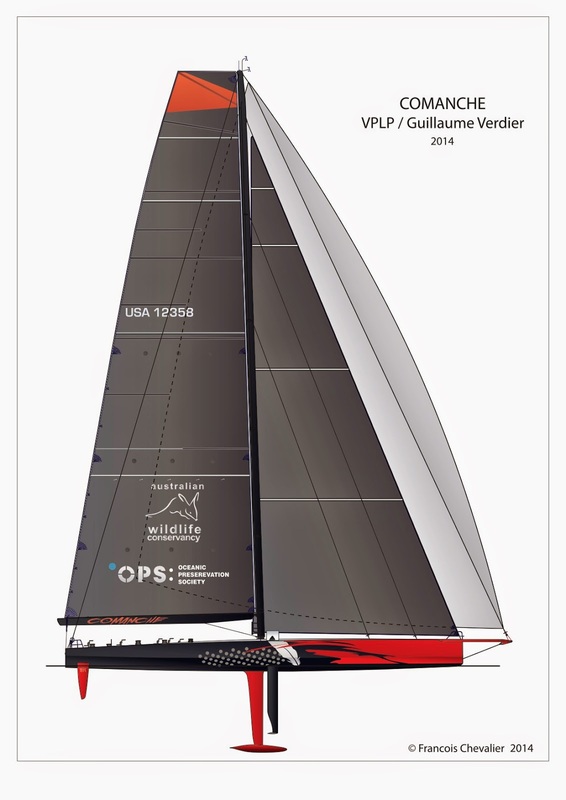 Among these is the brand new 100ft American raider Comanche, designed by French designers VPLP and Guillaume Verdier. Launched on September 27th, 2014, at the Hodgdon shipyard in Boothbay, ME, Comanche received her keel and Southern Spars rig in Newport and only had the time for a trial sail to Charleston, SC, where she was boarded on a container ship destined to Sydney. She was commissioned for Dr. Jim Clark, the founder of Silicon graphics and Netscape, who hopes to collect some silverware and break offshore records: She will be entered in the Sydney-Hobart, the Fastnet, the New York-Bermuda, the Transatlantic and Transpac races. She is also hoped to break the 24-hour record, the transatlantic monohull record (currently held by Mari-Cha IV at 6 days, 17 hours and 21 minutes). Potentially a circumnavigation record is also envisaged. Her skipper Ken Read, president of North Sails, said that "she is not made to race around the buoys". It took the Hodgdon shipyard barely twelve months to build the largest pre-preg carbonfiber yacht in the USA. The choice of the yacht's designers, VPLP and Guillaume Verdier, was largely due to their stellar track record in the 60ft IMOCA circuit. 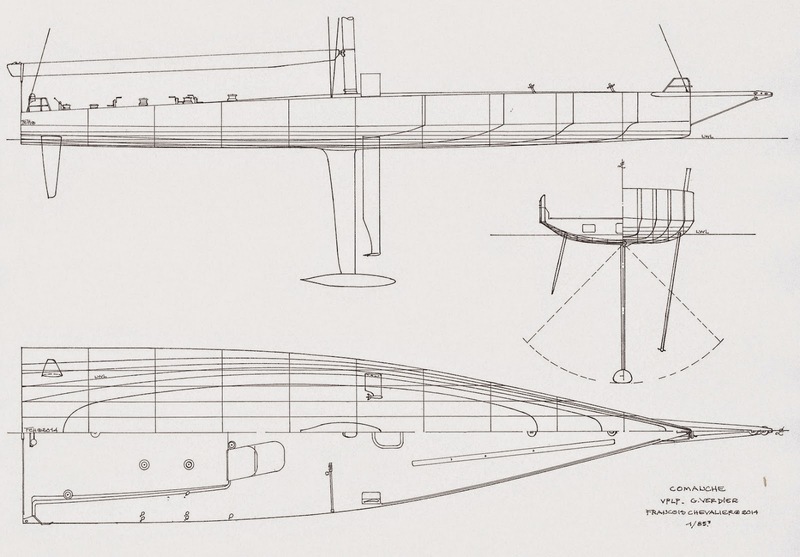 However, the size of Comanche does not suggest a mere extrapolation of the existing IMOCA fleet. With a hull length of 30.48m, a 7.85m beam and 6.67m draft, Comanche is significantly larger; She must comply with the IRC rating rule and also allow for victories on handicap, even if this not part of the owner's brief. All sail- sheeting, reefing and furling systems are human powered which makes Comanche eligible to take part in many races and set outright records, whereas her "powered sailing" 100ft competitors like Wild Oats XI are not. With a rating of 1.901, Comanche benefits from a lower handicap than that of the defending line honours winner Wild Oats XI at 1.973, which took the fourteenth place on corrected time. 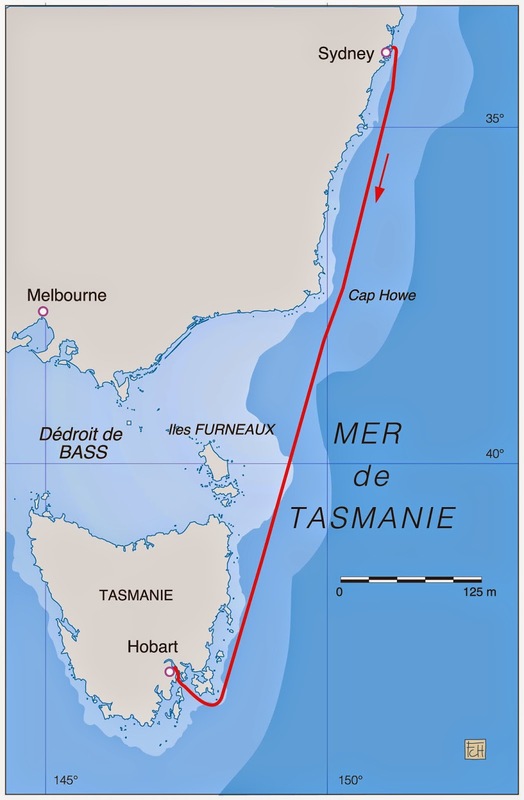 To win the overall prize, the supermaxis will need to complete the course in a race time close to, or under, the record of 1 day 18 hours, 23 minutes, 12 seconds, set by Wild Oats XI in 2012. To achieve this, strong downwind conditions will be required. The yacht designers are aware that the ultrawide hard-chine bilged hulls are unable to challenge narrow hulls in light conditions with under 5 knots of wind. But, since 1945, there have been more gales than calms in the 628NM race to Hobart. Launched three weeks before the 2005 Sydney-Hobart race, Wild Oats XI proved to be an immediate success. She is tied for the record for the most line honours victories in the Sydney-Hobart (7 out of 9 participations), two of which also claimed overall victories and set new records. 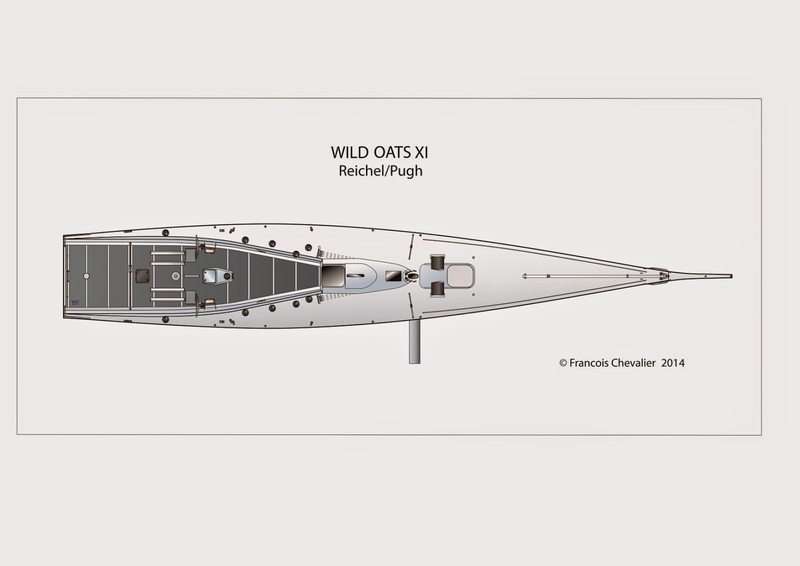 Originally a Canting Keel Twin-Foil (featuring a forward canard), Wild Oats XI has since undergone continuous appendage modifications. Her tendancy to nosedive in rough waters still limited her speed potential, so a solution licensed from Dynamic Stability Systems was developed and tested during the 2013 Hamilton Island Race Week. It consists of a lateral retractable foil, located just below the waterline that extends horizontally amidships. The thick carbonfiber foil measures 55cm along the chord; originally it extended 275cm outside the hull, but it has recently been lengthened. It is deployed on the leeward side to generate vertical lift and relieve the bow by adding buoyancy on the forward section and provide a better planing ability. A thick forward daggerboard was added in 2012 to stabilise the yacht in downwind conditions, especially to prevent broaches to windward and to leeward on the crests of waves. Indeed, on long and light displacement hulls like Wild Oats XI, especially those with a sail base extended by bowsprits, the centre of effort on the sails is shifted significantly foward when carrying downwind sails. The forward daggerboard prevents a lee helm in these conditions. This year, the buoyancy of the 2m bow section on Wild Oats XI was increased, and features a longer and lighter solid bowsprit and bobstay. Indeed, in the face of fierce competition from skimming dishes like Comanche and Perpetual Loyal, Wild Oats XI must bank on her unmatched performance in light airs. 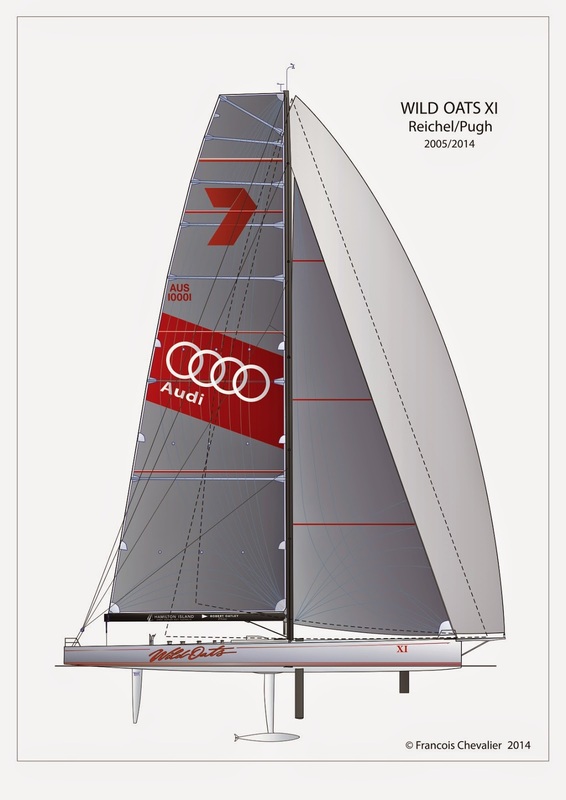 The lines of Wild Oats XI feature a slightly-rounded bilge, flaring topsides, a narrow waterline (4.10m) and a moulded depth located forward of the keel. In a heel, the sailing waterline extends the entire length of the yacht, the wetted surface is reduced and the leeward lateral daggerboard is deployed. It is important to note that the level centerline shifts very little when heeled, thus favouring good upwind angles. 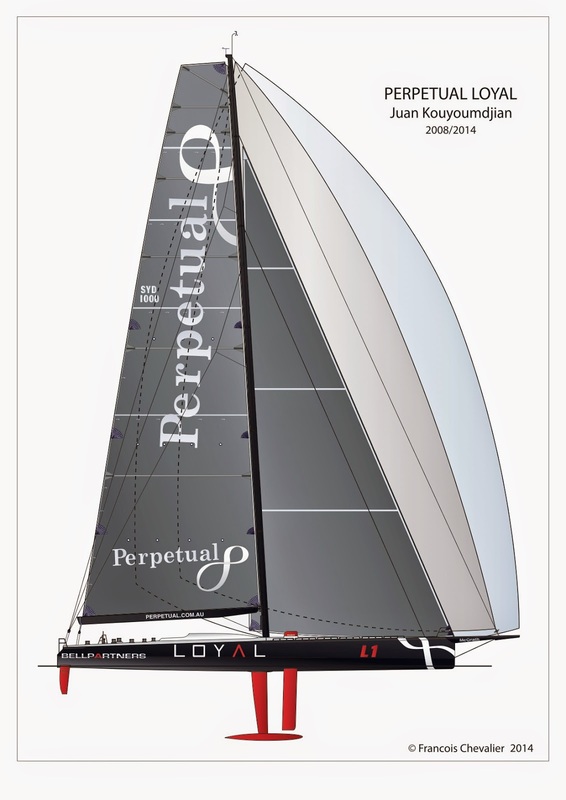 Perpetual Loyal, formerly Rambler 100, was acquired by New Zealander Anthony Bell, who had taken line honours in the 2011 Sydney-Hobart race on Investec Loyal (a Greg Eliott & Clay Oliver design dated 2005) 3 minutes and 8 seconds ahead of Wild Oats XI. 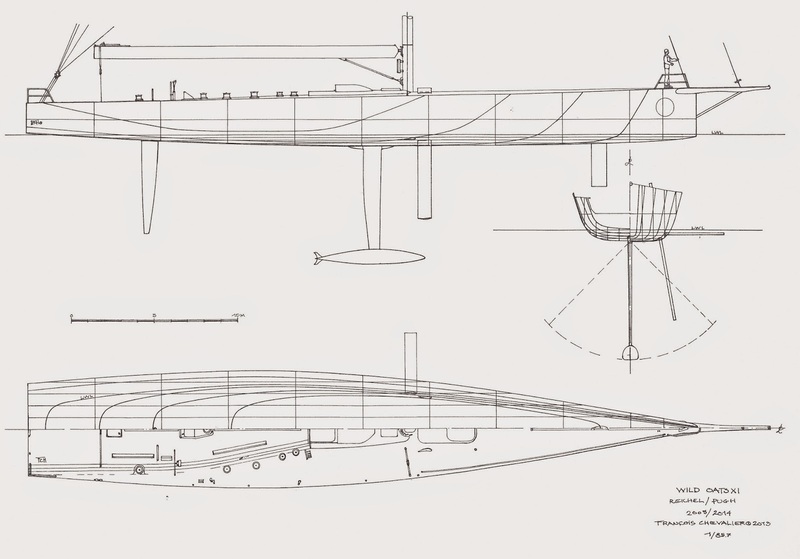 The new Loyal was designed by Juan Kouyoumdjian who developed an enlarged Volvo Open 70ft. When she was launched in 2008, she appeared extreme, whereas in comparison to the brand new Comanche, she is much narrower, slightly heavier and carries less sail area. Half the yacht's weight is located in the bulb which is swung to windward in a heel (In the 2011 Fastnet race her bulb detached and the yacht capsized, triggering a much publicized rescue operation). In strengthening winds, 8,000 litres of seawater can be pumped into the lateral liquid ballast tanks, providing her with a greater righting moment than any of her older competitors. Her planing ability in downwind conditions provide an exceptional speed potential. The series of Ragamuffin yachts are an integral part of Australia's sailing history. Her owner Sydney Fisher has taken part in the Sydney-Hobart race 45 times, taking the overall prize in 1992 and taking line honours on two other occasions. He has won the Admiral's Cup twice and countless other prizes since his first Ragamuffin from 1968. Mr. Fisher owns three yachts to cover his sailing endeavours, the newly rebuilt 100-footer, a 90-footer and a TP52. 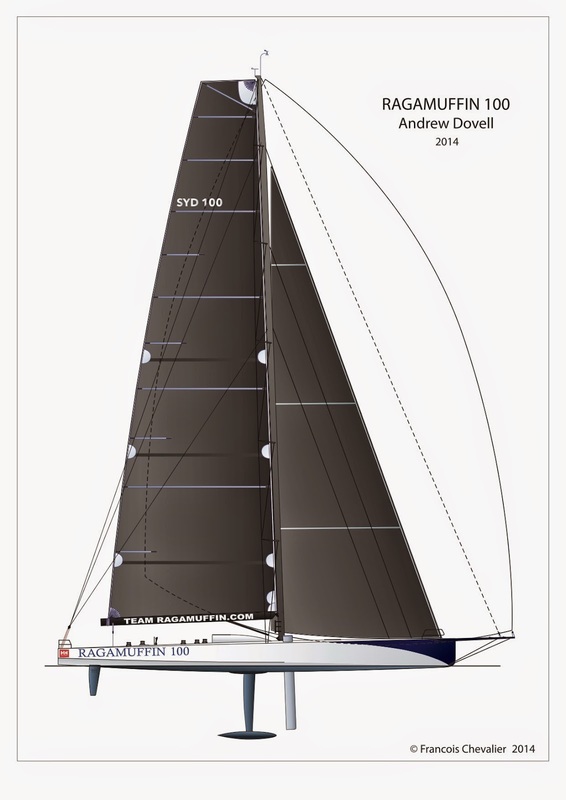 Born on the draftboarts of Andrew Dovell, the new Ragamuffin 100 has just left the Innovation Composite shipyard. 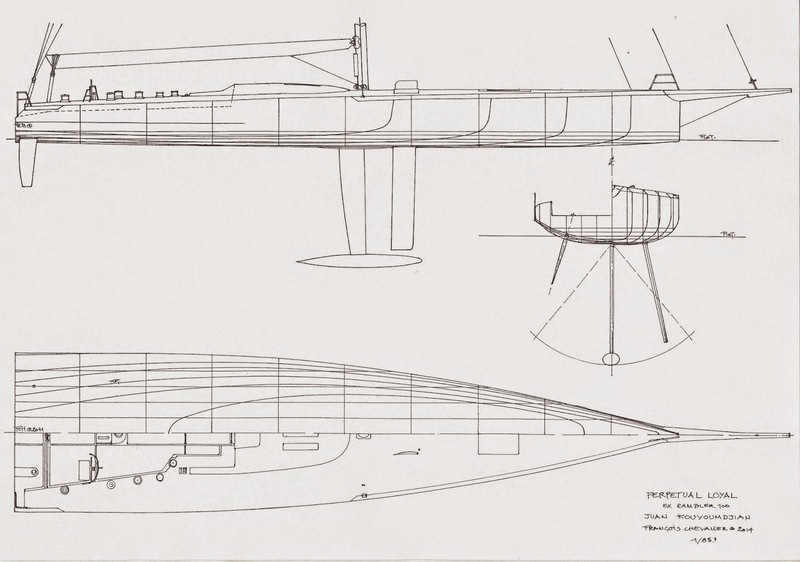 Christened on December 2nd, 2014, she is a versatile compromise incorporating the very latest thinking and technology, designed to perform well in all weather conditions, unlike Perpetual Loyal and Comanche, and should be very capable in the light airs that often linger on either side of the Bass straight in Sydney or Storm Bay. She features a hard chine bilge, a moderately wide beam, a short, very flush waterline, a centered deck plan with helm stations located far forward as well as large liquid ballast tanks to adjust the pitch angle or improve the righting moment. 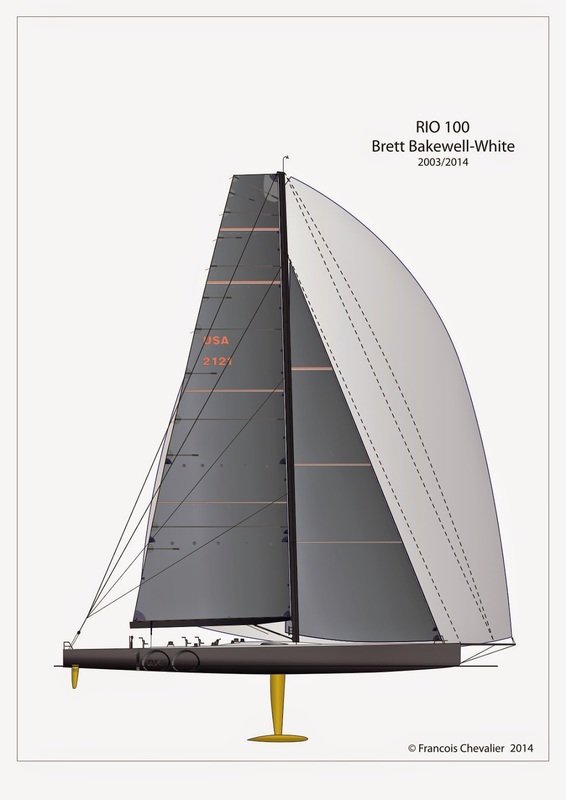 Built in New Zealand in 2003, Zana has been rechristened to Rio 100 this year, following significant modifications carried out at the Cookson shipyard under the supervision of yacht designer Brett Bakewell-White and her skipper Keith Kilpatrick. She was cut in two amidships, widened on her stern, lightened and fitted with twin rudders. She was fitted with a new dropkeel, but lacking a canting keel, she cannot carry as much sail area as the other 100 footers. Her principal strength is her extreme lightness, six to eight metric tonnes less than her competitors and her low handicap, with a IRC/TCC rating of 1.723. Her new owner disclaimed: "I doubt we'll do well against the other 100's with canting keels - but I think we will have a great time participating in the race - and of course there is always that one in a million chance that it becomes an 8-15 knot downwind race."